The decades-long Cold War was more than a bipolar conflict between two Superpowers-it had implications for the entire world. In this accessible, comprehensive retelling, Carole K. Fink provides new insights and perspectives on key events with an emphasis on people, power, and ideas. Cold War goes beyond US-USSR relations to explore the Cold War from an international perspective, including developments in Africa, Asia, and Latin America. Fink also offers a broader time line of the Cold War than any other text, charting the lead-up to the conflict from the Russian Revolution to World War II and discussing the aftermath of the Cold War up to the present day. 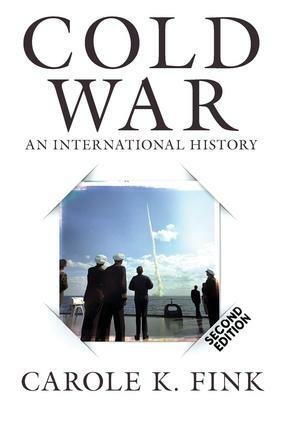 The second edition reflects the latest research and scholarship and offers additional information about the post-Cold War period, including the "new Cold War" with Russia. For today's students and history buffs, Cold War is the consummate book on this complex conflict. Carole K. Fink is Humanities Distinguished Professor of History Emerita at The Ohio State University. She is an award-winning author, editor, and translator of 12 books, including Defending the Rights of Others, The Genoa Conference, and Marc Bloch: A Life in History, and has been the recipient of numerous fellowships, most recently from the Institute for Advanced Studies at Princeton, the German Marshall Fund, the U.S. Holocaust Memorial Museum, and the Fulbright Foundation.